“We have shown Susie’s work in Science Gallery on two occasions – in 2008 we put together a show PILLS with a collection of Susie’s work and her work Bacteriology Illustrated was shown as part of our flagship show INFECTIOUS in 2009. “Science Gallery vision is to ignite creativity and discovery where science and art collide – we aim to connect with and surprise our visitors with intriguing and thought provoking work. Susie’s beautifully, intricate textile work coupled with an insightful production often surprised our audiences and engaged them in a process of considering their and societies relationship with commonly prescribed drugs and the medical world generally. “Initially I tore up a page in an attempt to isolate key words, placing each selected bite size piece in its own pocket. However, it seemed important not to discard anything. 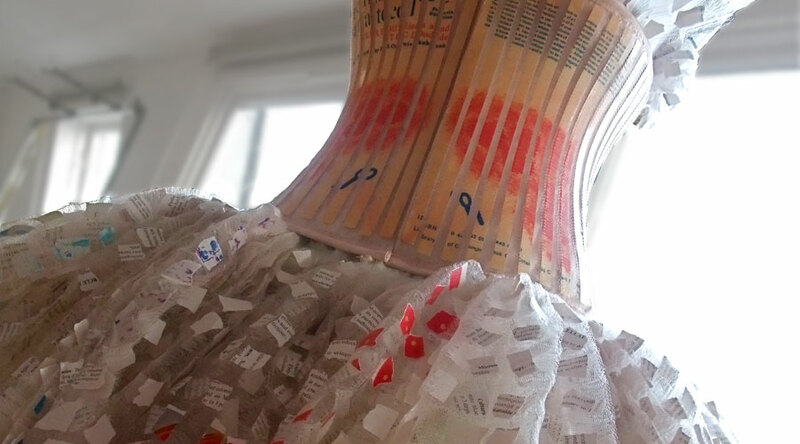 “The dress is now formed from every page of the book. The process was painstaking and precise, each page torn into 130 pieces and placed in correct sequence to form reconstructed pages paired across the weft. Running along the warp two by two for 610 rows, there are 15,860 pockets in total. I combined the dress with a ‘doctors bag’ containing the tools of defense against infection collected in the surgery.